I got to spend a lovely few days in Manchester and Liverpool doing fun things last week. This obviously required a new dress - a second, and again, slightly modified Megan dress from Tilly Walne's Love at First Stitch. I bought the fabric quite a while ago with the Megan in mind. To be honest, I don't normally wear white. In fact, I avoid buying pale coloured clothes and fabric all together so I don't have to put a white wash on (ha!). I just had one of the moments in the fabric shop where you just picture an amazing version of a pattern coming to life. It's a poly cotton with a slight bit of stretch to it, and like my last Megan, that stretch and movement really helps the fit. I had a bit of help inspiration-wise from a cinema trip to see Northern Soul. It really captures the sounds, styles and fashions of the era, and spurred me on to finally get this dress made! The dress took no time at all to whip up. I'd made a few tweaks last time and stuck with these. There's an extra inch added to lengthen the bodice/stop those tucks getting lost under my bust just like before. This time I also took a centimetre off the centre back too. 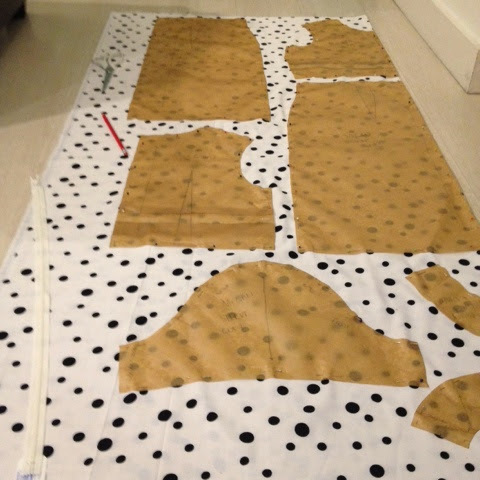 I've been doing a pattern drafting course in the evenings at art college, and it's helped me to realise that the amount of fabric I need at the back is significantly smaller than what I need to cover my front (Light bulb moment!). I'm really pleased with the overall fit - it's probably a bit better and more comfortable than version 1. Also, of course, there's the added collar. 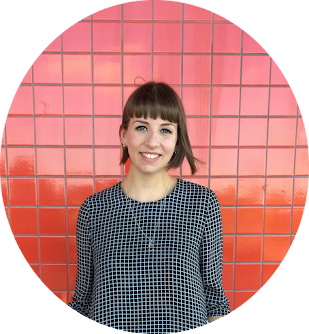 Last time I drafted a Peter Pan collar, but this one definitely called for the pointed contrast collar. I based this one on the wonderful Emery collar that I can't stop swooning over! I'm so pleased with the dress that I think I'm going to have to make more pale garments to make the white wash worth it! 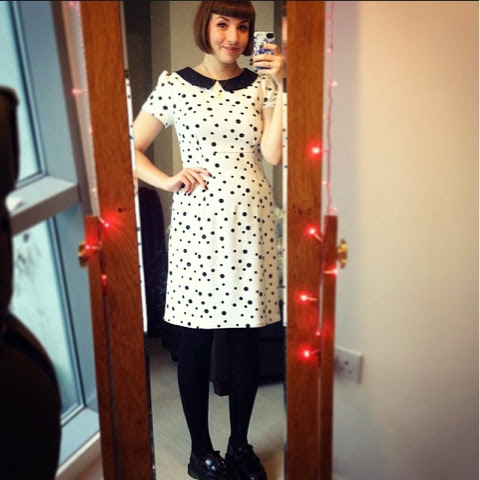 The polka dots and collar have just the right amount of impact. I'll be wearing this one as a day dress and for going out too! A pattern drafting course sounds really useful, I think I need one! The fit on my current bodice muslin (on my third now *groan*) is driving me nuts. 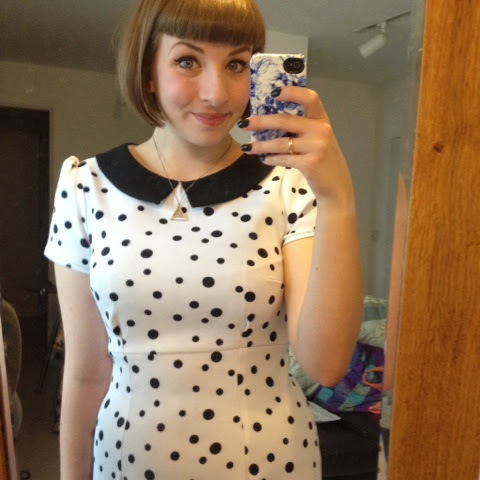 Love this dress - the fit is perfect and that collar is adorable. I've been umming and ahhing about the Megan dress for a while but I think you've just swayed me! To the fabric stash! The contrast collar is perfect- good call! This is goregous! 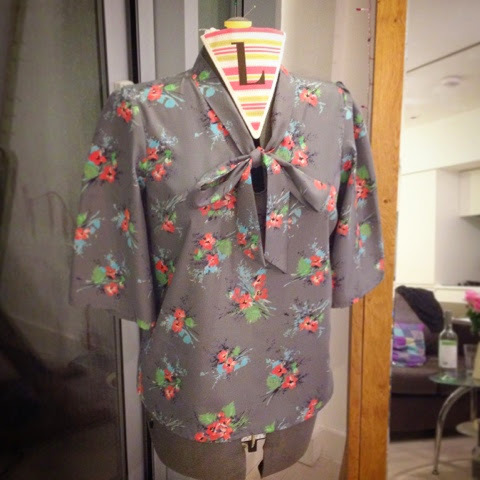 This pattern has bumped itself way up my sewing queue after I saw so many lovely versions on Tilly's blog. I love the collar you've drafted, and was thinking of the same style myself, but with the gap to one side instead of at the centre. 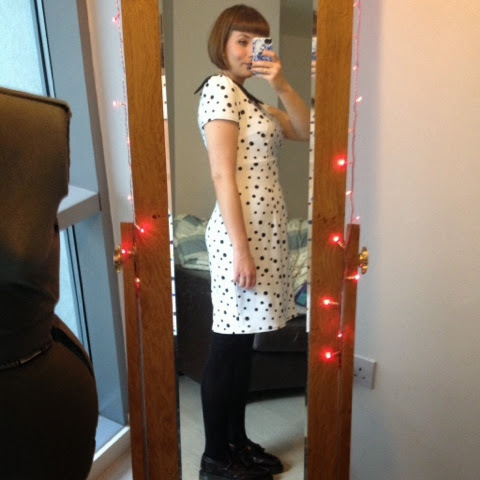 I love that fabric, such a fresh and modern take on polkadots :) And the fit is spot on too! This is absolutely adorable! It looks like it fits you really well.